As promised this is the second and last post on LASplash Cosmetics and today I'll introduce you to a trio that have been dominating my makeup for the past few weeks. I honestly can't remember the last time I was this obsessed about a lip product, let alone three of them. 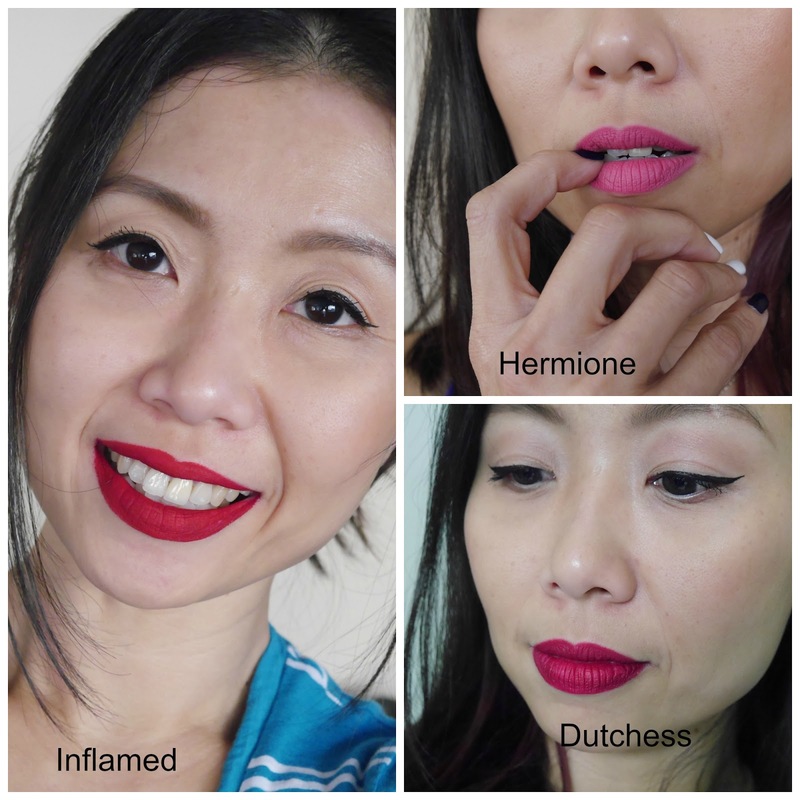 While the Lip Couture trio (reviewed here) were unique shades that blew me out of my comfort zone, these three from Studio Shine Lip Lustre range (check here) and Smitten Liptint Mousse (check here) are gorgeous, every day wearable shades. There are no words to describe how much I love these and all my other lipsticks have been packed away into the box of doom aka lipstick graveyard. The shades are bright, bold and downright stunning. 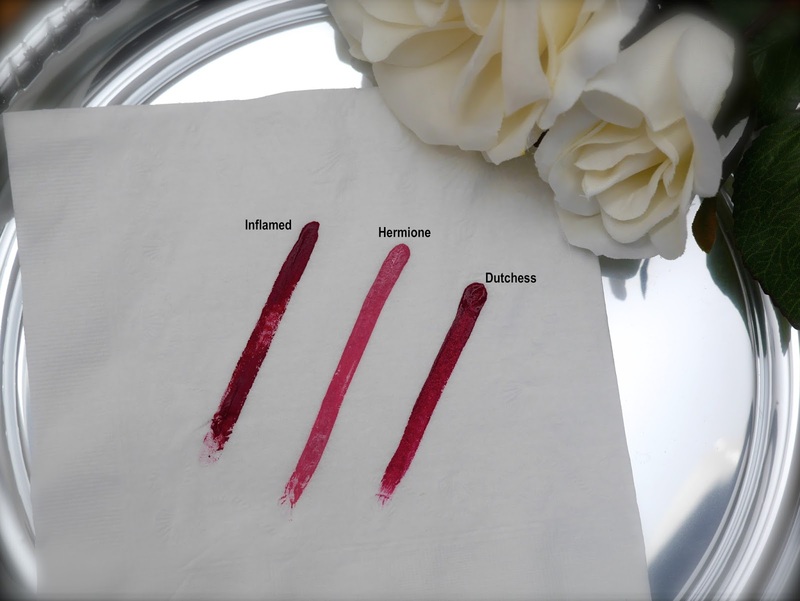 Inflamed* (bright, true red) and Hermoine* (soft pink) are from Smitten Liptint Mousse range and Dutchess* (deep ruby red) is from Studio Shine Lip Lustre range which is glittery or as LASplash Cosmetics describes it, fairy dusted. I usually frown on a lip product that has glitter (like seriously, why would you do that?!) surprisingly, Dutchess is the one that I have been reaching for the most. The glitter is very subtle, you won't feel it on your lips and I personally feel it lends a sophisticated touch to my makeup. It's Audrey Hepburn elegance with a wee bit of shine and not, "I pissed off my fairy godmother so she farted all over my lips". I personally find the addition of glitter is the most noticeable difference between all three ranges because texture wise is very similar with the exception of Smitten Liptint Mousse which is very slightly thicker than Studio Shine and Lip Couture. These are opaque at one swipe, additional layers are completely unnecessary and they stay on forever. Like forever ever and then some more. If there is ever a zombie apocalypse and you want to remain glamorous while running away from those buggers, then swipe on one of these liquid lipsticks and I promise you it'll remain on your lips until humanity rebuilds itself. So what's the negative I hear you ask? Just like Lip Couture, these also don't budge. The removal process is the same; oil based remover only. Using anything other than that is inviting trouble but as I previously said, it doesn't bother me because the pros far outweigh the one con. I can't rave enough about LASplash Cosmetics liquid lipsticks, like where have they been all my life? If you love liquid lipstick or are new to it then I highly suggest these, you will not be disappointed! Canadian beauty lovers need to be aware that purchasing products from LASplashCosmetics.com will cost higher due to the currency exchange. Clicking Canada doesn't direct you to the Canadian website instead you remain on the same US site but price shown in CAD so you will be paying USD to CAD currency exchange and shipping fees. I highly advice purchasing from LASplashCosmetics.ca if you're in Canada. Talk to me...are you a lip gloss, lipstick or liquid lipstick person?